Delve into the secret world of tarot reading with this fascinating box set. Used for centuries to understand the present and predict the future, tarot has always been a source of fascination. 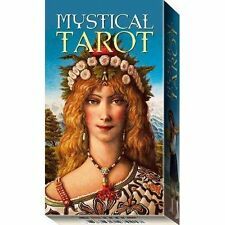 Easy Tarot Cards Deck and Book Set. Postcards from Spirit A 52-Card Oracle Deck by Colette Baron-Reid 9781401951535 (Cards, 2017) Delivery UK delivery is within 3 to 5 working days. International delivery varies by country, please see the Wordery store help page for details. Crystals, like tarot cards, have for centuries been used for healing and divination. They beautifully blend traditional tarot imagery with crystals: The Sun card has a sun of topaz, and the World card shows the traditional world dancer holding wands of quartz. By Lucy Cavendish (NEW & Sealed). Alice the Wonderland Oracle. 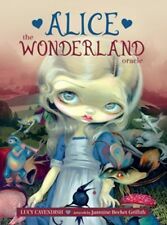 ALICE: THE WONDERLAND ORACLE is for the curious, the daring and for those longing to make of their lives the most marvellous adventure. 2019 Calendars 2019 Diaries 50% OFF SALE! ISBN-13: 9781780288291, 978-1780288291. Here is the full text of the fables that were revealed by angels to the popular intuitive Tori Hartman and then lost for two decades. Week by week, you will explore the 49 fables, beginning with "Renewal" - the fable of Geranium, which promises a new beginning. 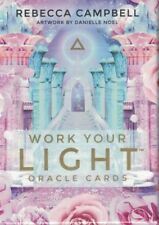 Work Your Light Oracle Cards by Rebecca Campbell 9781781809952 (Cards, 2018) Delivery UK delivery is within 3 to 5 working days. International delivery varies by country, please see the Wordery store help page for details. Kawaii Tarot A 78-Card Deck of Magic and Cute by Diana Lopez 9781454929079 (Kit, 2018) Delivery UK delivery is within 3 to 5 working days. International delivery varies by country, please see the Wordery store help page for details. But that is not the whole story – dragons are complex creatures, and the beast is usually credited with cunning and often the power of speech – it is not just a brutal, terrifying monster. Although occasionally hostile, as when an earth dragon stirs and human cities crumble, there is no personal malice. Simply Tarot Wealth Love Destiny. Author:Amanda Hall. We appreciate the impact a good book can have. We all like the idea of saving a bit of cash, so when we found out how many good quality used books are out there - we just had to let you know! Three question yes/no pendulum reading... once the questions have been answered I will draw one card that will relate to one of your questions (this will be determined by the strength of the answer from the pendulum... using the one with the strongest response) and will take a deeper look into the answer. I take a lot of time, care and love with the readings that I do so all I ask is that you leave feedback after your reading. Quite simply a reading given by myself from my own personal tarot card deck. This will be given in the form of a general reading by how my cards are dealt with yourself specifically in mind. I have been reading cards for myself for a good 9 years now and have read for friends. 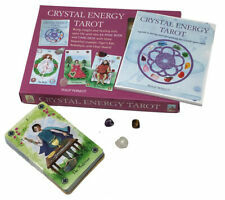 The Tarot Card Kit Book Deck And Crystal Gift Set Box. Condition is Good. Dispatched with Royal Mail 2nd Class. Tarot Elements Five Readings to Reset Your Life by Melissa Cynova 9780738758404 (Paperback, 2019) Delivery UK delivery is within 3 to 5 working days. International delivery varies by country, please see the Wordery store help page for details. Condition is Good. Very handy bundle - the cards are beautifully illustrated. TAROT of THE SPIRIT Deck & Companion Book .As NEW. perfect condition. Condition is Like New. This deck has only been looked through and never used, in mint condition. Includes transparent Tree of Life card. 5 out of 5 stars - TAROT of THE SPIRIT Deck & Companion Book .As NEW. perfect condition. 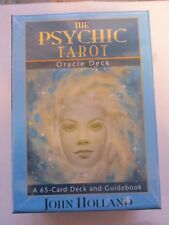 1 product rating1 product ratings - TAROT of THE SPIRIT Deck & Companion Book .As NEW. perfect condition. Luminous Spirit Tarot. Labyrinthos. NEW. Beautiful . Purchased from USA. Luminous Spirit Tarot. Condition is New. Second Edition. With wonderful Holographic backs.beautiful! The Faeries Oracle uses artwork by Brian Froud whose enchanted artwork has also been used for conceptual designs for films like the Dark Crystal and Labyrinth as well as his own publications. Complete deck of 66 cards designed by Brian Froud. Perfect Condition. No cards included fyi. The Lost Code Of Tarot Andrea Aste. Condition is Like New. Dispatched with Royal Mail 2nd Class. I bought deck brand new and have used once. These cards were just not for me, better for experienced readers. Spirit Messages Oracle Deck Tarot Cards Reading Spiritual John Holland. Condition is New. Dispatched with Royal Mail 1st Class. 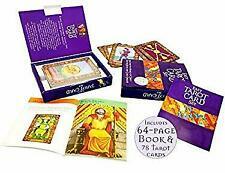 Includes full set of Tarot cards and guide book. Start of another tarot deck - unopened. 2 velvety bags for tarot, crystals etc. Not all the gifts are with the magazines, here's whats included -. 52 issues of the magazine - these are opened but new, I haven't read them. 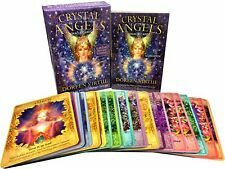 Crystal Angels Oracle Cards: A 44-Card Deck and Guidebook. A 44 Card Deck of Specially Commissioned Oracle Cards. A 107-Page Guide Book. We will always help you to have a 100% positive happy buying experience. As new but not sealed. Weight of the deck: 254 g. (0.56 lbs) (approx). 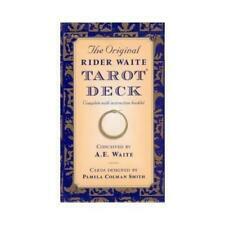 It is very popular among tarot readers. You must be 18 or older to receive a reading. I do not give health readings or predict pregnancies. I work only with love and light which I hope to share with you. The Akashic Tarot is a tool for predicting the future, unveiling hidden insights and unleashing new powers. 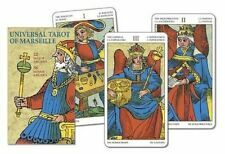 Let this amazing Tarot deck transport you to the Great Hall of Records to find the answers you seek. Very good and accurate reading. Always happy with her reading. Fast reply and follow-up. She's good. Psychic Tarot Reading Plus Angel Message. Archangel Gabriel is the beloved angel who announced, "Behold, I bring you good tidings of great joy!". Archangel Gabriel Oracle Cards. Title:-Motherpeace Tarot Guidebook. Author:-Vogel, Karen. Davide Corsi. The vivid illustrations in this stunning deck bring the arcana to life like never before! Publisher Review: Chutzpah: (Yiddish) 1. Impudent rudeness or lack of respect. One of the major milestones in the history of the Tarot was the publication of the book, The Pictorial Key to the Tarot by A. E. Waite a century ago. 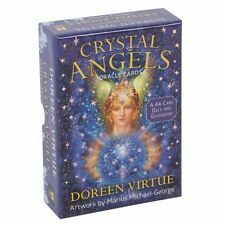 Archangel Gabriel Oracle Tarot Cards by spiritual psychic Doreen Virtue in excellent clean unused condition. Author : Doreen Virtue. Archangel Gabriel is the beloved angel who announced, 'Behold, I bring you good tidings of great joy!'. A 44 Card Deck of Specially Commissioned Oracle Cards. Subject: Mind, Body & Spirit. Very good and accurate reading. Excellent and lovely lady, Millie always so helpful and straight to the point. Always happy with her reading. Fast reply and follow-up. She's good. Author:Monte Farber. The Enchanted Tarot. Each month we recycle over 2.3 million books, saving over 12,500 tonnes of books a year from going straight into landfill sites. All of our paper waste is recycled and turned into corrugated cardboard. Deck and book in very good condition. There is a slight tear to one side of the box, please see 3rd photo. Although occasionally hostile, as when an earth dragon stirs and human cities crumble, there is no personal malice. Dragons simply operate by different laws that do not always place our interest at their centre. Miniscule wearing in corner. Book itself is perfect.